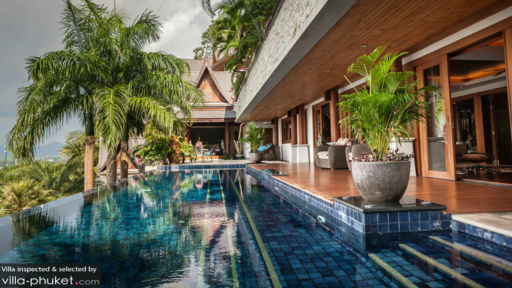 Villa Shambala in Phuket’s Surin beach is a tropical paradise in its own right as it celebrates island living, infusing the charm outdoor with that of the comfortable indoors. The living areas have been designed both outdoor and indoor so that guests can enjoy a worldly experience of being in two places at the same time. With four, similarly-designed bedroom suites to cater to guests, the villa is ideal for families, friends, and those traveling with kids. The infinity-edge swimming pool is the tip of the iceberg from where you can catch the remarkable sunset while lounging at the swim-up bar! To avoid a brawl over which room to take, Villa Shambala offers an easy solution in which all four bedrooms have been designed as well-appointed master suites. They offer a furnished sitting area with comfortable sofa beds, king-sized beds, large windows for excellent views, and cozy interiors. The air-conditioned bedrooms are accompanied by an en-suite bathroom done up entirely in marble, with terrazzo bathtubs. With a stunning landscape stretching out in front, you require nothing more than a lavish swimming pool, with an infinity-edge no less, and you are all set. There are abundant tropical plants and trees dowsing the pool area in a soft natural light, adding a meditative stance to the area. 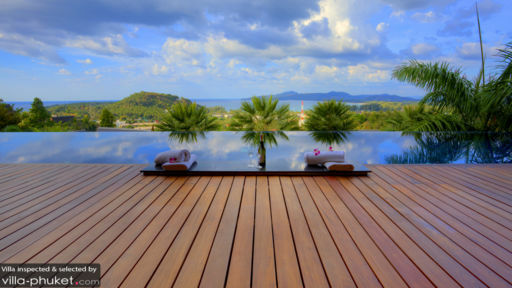 Thai sculptures decorate the timber pool deck, and several rattan chairs offer a comfortable place to relax after a dip. Housed under a traditional Thai gazebo, you will find a plush daybed on which you are welcome to take a nap. A swim-up bar with granite stools sunken in the water, is the place to get your chilled cocktails! An alfresco dining area to allow you to experience dining under the stars is also available. At Villa Shambala, the living areas are indeed resonant of an opulent space with polished wood interiors, plush couches, selective upholstery and artsy rugs. As you enter through the front glass doors, there is a media lounge on one end, with a massive flat-screen TV and comfortable sofas and chairs. From here you can even take in the gorgeous view of the ocean and the neighboring areas. Adjoined to the lounge is a partially outdoor living area with a striking stone wall, open-ended back and front and proper ceiling. This part has been furnished with cozy rattan sofas and chairs to offer another space for guests to relax in. The other end of the lounge is occupied by the six-seater dining table on which guests will be lavished with excellently-prepared meals by the house chef. A fully-equipped kitchen, a yoga pavilion and a spa are just a few of the other amenities available to guests. The luxury of renting out a private villa translates into receiving excellent service from the well-trained staff. With personal guest assistance, assuredly your stay is bound to be one that is memorable. The villa manager is there to oversee the proper functioning of the villa along with housekeeping, pool and garden maintenance and the rest of the management. They can even prepare child-friendly items for guests so you don’t have to lug everything around. The staff can arrange for in-house Thai massage, Aromatherapy massage, and manicure/pedicure. The skilled house chef will wow you with cooking skills preparing delicious meals exclusively for you! From the villa itself, one can view the white sands of Bang Tao, the resorts in the neighborhood, and the village in the valley. The villa is merely 500 meters away from Surin beach, so guests can head down whenever the wish and the Laem Singh beach is also not far. For brunch, you can check out Twinpalms Oriental Spoon, Palm Seaside and Catch Beach Club.